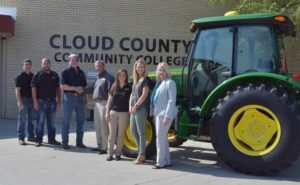 A grant from the Hansen Foundation assisted in the purchase of a new tractor to be used in a new precision ag course. Ag instructors received training and assistance in building a curriculum to provide students pursuing a Precision Agriculture Production Degree or Certification the best learning experience possible. Students planning to move back to the family farm or work on a farming operation are now provided the knowledge they need to become a more profitable producer.